The /n software SSIS Task Library provides robust, enterprise-ready Internet connectivity, secure messaging, compression, and secure file transfer for SQL Server Integration Services (SSIS). The /n software SSIS Tasks for Microsoft SQL Server Integration Services consist of a single task library containing individual tasks for Internet communications. Built from the same core codebase as the /n software Adapters for Microsoft BizTalk Server, the SSIS Tasks provide robust enterprise ready Internet connectivity, secure messaging, and file transfer. Support for Microsoft SQL Server Integration Services (SSIS) (2005, 2008, 2012, 2014, & 2016). Fully-managed .NET tasks written in pure C#. Fully-integrated with the Microsoft Business Intelligence Development Studio. START_TLS security protocol extension support. Strong 3DES encryption, message integrity checking, secure secret key exchange. Advanced SOCKS firewall and proxy support. Supports up to 256-bit (strong) encryption. CloudStorage SSIS Task - File storage with S3, Box, Dropbox, Google Drive, etc. Dropbox SSIS Task - Easy uploading and downloading to and from the Dropbox service. 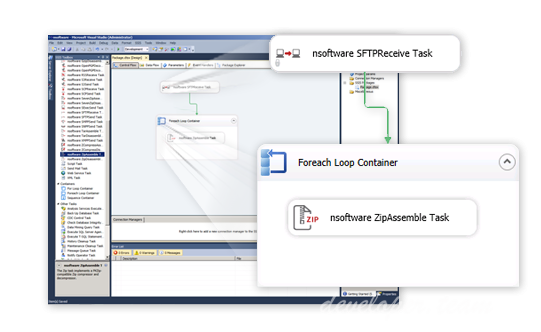 FTP SSIS Task - FTP Task with advanced firewall support; SSL Enabled (FTPS). GoogleDrive SSIS Task - Easy uploading and downloading to and from the Google Drive service. HTTP SSIS Task - Flexible HTTP client to send and receive data to Web servers. OFTP SSIS Task - Odette File Transfer Protocol (OFTP) Task with OFTP2 support. OneDrive SSIS Task - Easy uploading and downloading to and from the OneDrive service. RSS SSIS Task - RSS client Task for consuming RSS feeds. S3 SSIS Task - Easy uploading and downloading to and from the Amazon Simple Storage (S3) service. SCP SSIS Task - SSH-secured file transfer. Secure Email SSIS Tasks - SSL-protected email (SMTP/POP/IMAP). Secure Shell (SSH) SSIS Task - Executes remote commands over SSH. SFTP SSIS Task - Secure File Transfer through SSH-enabled SFTP. SMPP SSIS Task - Short Message Peer-to-Peer SMS messaging Task. SNPP SSIS Task - Alphanumeric paging Task. SPOnline SSIS Task - Easy uploading and downloading to and from the SharePoint Online service. TCP Client Task - Basic TCP client communications. Telnet Task - Send Terminal Access Commands via Telnet. Wasabi SSIS Task - Easy uploading and downloading to and from the Wasabi service. WebDAV SSIS Task - SSL-enabled WebDAV send and receive capabilities. XMPP SSIS Task - Jabber / XMPP instant messaging Task. AES SSIS Task - 128-bit, 192-bit, and 256-bit AES encryption/decryption. BZip2 SSIS Task - BZip2 compliant compression/decompression. EzCrypt SSIS Task - Used to encrypt and decrypt data (AES, DES, Triple DES, Blowfish, etc.). Gzip SSIS Task - Gzip compressor and decompressor, compliant to RFC 1952 and compatible with the UNIX gzip and gunzip utilities. Hash SSIS Task - Hash Task can be used to calculate hash values (SHA1, MD5, HMAC, etc.). OpenPGP Task - Sign, verify, encrypt, and decrypt through OpenPGP. SevenZip SSIS Task - 7zip-compatible Zip compressor and decompressor. Tar SSIS Task - Tar archive pipeline. Compatible with the UNIX tar and untar utilities. ZCompress SSIS Task - LZC (UNIX Compress) compressor and decompressor.